Cornell University is extremely fortunate for its politically active and socially conscious student body. Nowhere is this precious resource more apparent than at the Spring People’s School, held tomorrow [the 18th of April] as a gathering to help foment the creation of an engaged community. “The winter is for reflection. The public spaces are frozen over, the trees become transparent, and on a late night walk home from the library, we might be tricked into believing there’s no one else here. The biting winds urge us to introspection. As it turns out, communities aren’t just built in the streets. They’re built at late night meetings in empty classrooms, at study sessions in dimly lit cafés, and anywhere else where people come together out of a collective purpose. Our houses, our studios, our seminar rooms, our libraries, and our student unions can all be spaces of transformation. After all, isn’t “the streets” just a metaphor for the spaces where we find each other? Isn’t the public just a euphemism for the place in which we make us? Over the course of this long, harsh winter, we’ve all been building our community. Some with more success than others. For many of us, these communities have been our only support systems. Winter can be a time when the isolation, work, and pressure of life at Cornell comes to a head. It is often a time of self-doubt, suffering, existential crisis, and sleep-deprived delusions of inadequacy. The tediousness of our daily existence voices what many of us so take for granted that it never gets said aloud. We aren’t happy here. And the “here” in that sentence may be unnecessary, because it doesn’t end when we graduate. The jobs we are being trained for are the jobs we already have. Deadlines, long hours, stress, and precariousness: such is the life we live; such is the life we look forward to. When you were told that college would be the best years of your life, you didn’t imagine how bitterly accurate that prediction was. But it is not inevitable. What will we demand from ourselves, from this world, from the system in which we are all involuntary participants? The crucial word in that sentence is the first one. We. It is worth clarifying that “we” does not refer to a collection of individuals who all, individually, feel unhappy. Of course, there are students who do sincerely feel happy here. You may be one of them. But we is a statement of collective identity which by definition is more than the sum of its parts. It is important that while some of us may be content, “we” won’t be, because our happiness is bound up in the happiness of those around us; our liberation is bound up in the freedom of those with whom we share this community. As Martin Luther King, Jr. said, “Injustice anywhere is a threat to justice everywhere.” As long as there are underpaid, under-resourced, under-respected workers, survivors of sexual assault blamed for their own trauma, and students breaking under the pressure of their own absent future, we will not be happy. There is no social change without the word we. Because if we share a problem, then we can do something about it. The spring is for action. It’s for taking public space, it’s for demanding a meaningful existence, and it’s for realizing we all felt the same in the winter. It means turning our isolation on its head by realizing that it is something that we share. The spring means breaking down the barriers that keep us isolated: between ourselves and our neighbors, between the estranged communities at Cornell, between Cornell and Ithaca College, between students and workers, and between discussion and action itself. It means destroying false binaries, whether they are male/female, gay/straight, or deconstructing privilege/constructing solidarity in its place. 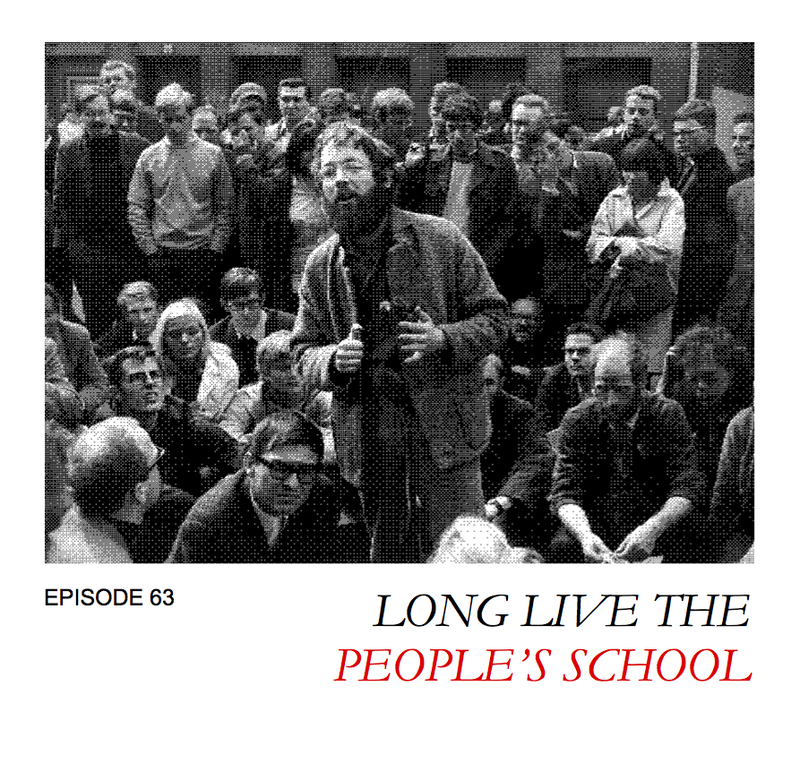 Last fall, we began the process of constructing a new world at the People’s School. In that spirit, we invite you all to converge once more, on the Arts Quad, to continue the community-building process we started at the beginning of the school year. Students, workers, faculty, and local residents are all welcome, because although it affects us in different ways, we all live under the same system. We will meet on Thursday, April 18, from 10:30 to 4:30. There will be a poetry slam on the Stump starting at 12:15. And come May Day, when we say we’ll see you in the streets, we’ll mean it literally. We have created this mix to celebrate the People’s School christening of the Springtime in the name of the forces of good. Sonic Landscapes highly endorses this event, and encourages listeners to come and participate in this wonderful day of solidarity and egalitarianism. See this link for the facebook page for the event and make sure to invite friends.